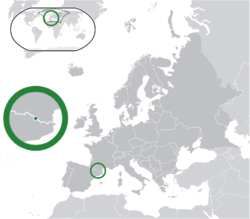 The Preencipality o Andorrae (Catalan: Principat d'Andorra, French: Principauté d'Andorre, Spainyie: Principado de Andorra) is a gey wee laundlockit preencipality in south-wastren Europe, locate in the eastren Pyrenees muntains atween Fraunce an Spain. It haes twa princes as its heids o state; baith thir princes hauds thair poseetions ex officio as preses o France an Beeshop o La Seu d'Urgell respective. The princes are Nicolas Sarkozy an Joan Enric Vives Sicília the nou. Wikimedia Commons haes media relatit tae Andorra. This page wis hintmaist chynged oan 15:08, 8 Mairch 2013.